Sports fans can be crazy loyal. We all know that guy who hasn’t missed a basketball game played by his alma mater in the past five years. Or that woman who decorated her living room with her team colors. While college-themed home decor might be a bit extreme, I’ll admit that as University of Iowa alum, when the Hawkeyes are playing, you can find me decked out in black and gold gear, watching my team and enjoying a good beer! As a marketer, sports fans are a prime target market, especially during big events like the NCAA Men’s Basketball Tournament. The question is, just how do you reach these folks if you don’t have the multi-million dollar March Madness marketing budgets of the big brands? One solution: Take advantage of basketball fans who are tuned in to their “second screens.” Eighty-nine percent of folks use a second screen — a laptop, a mobile phone or a tablet — while watching TV. This means there are plenty of opportunities to get in front of fans during the games, not to mention the days leading up to big match-ups. Below I’ve created a list of online March Madness advertising ideas you can try to increase customer engagement and gain new leads. 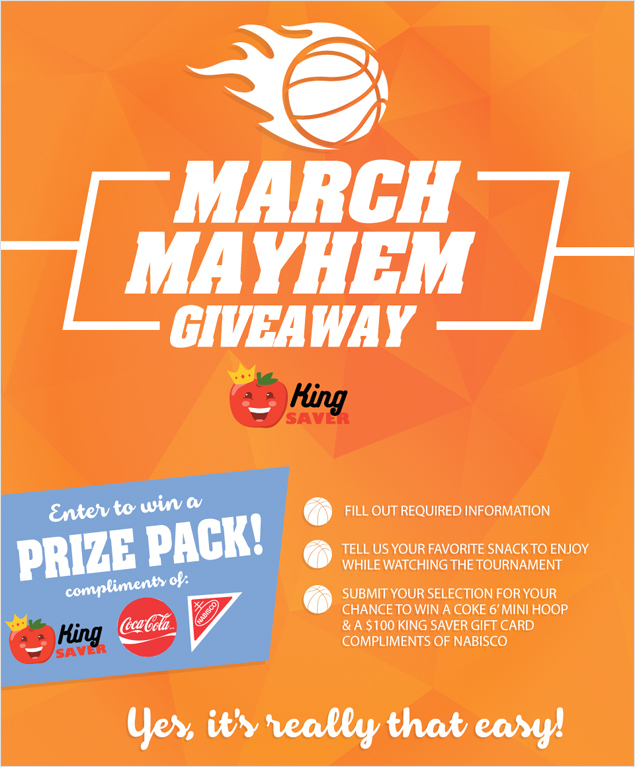 A quick word of warning before you dive in any deeper — avoid using the words “March Madness” in your campaigns since the term is trademarked and using it could bring you a cease and desist order from the NCAA. Give folks a chance to pick winners. Just say “March Madness” to anyone and the first thing that pops into their mind: brackets. Folks love filling out brackets to show just how well they know college hoops. From people who choose winners based on college names, seeds and mascots, to those who take yearly stats, historic performances and analyst reviews into account, everyone dreams of that perfect bracket (though you only have a 1 in 9,223,372,036,854,775,808 chance to pick all of the games correctly!). Well, guess what? 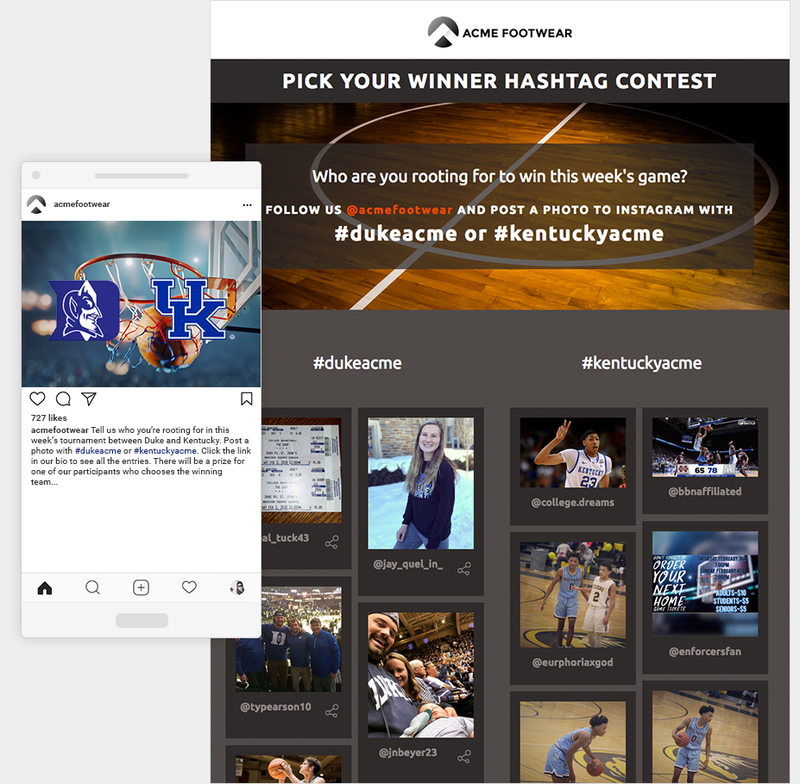 We’ve designed a killer Bracket Contest campaign you can use on your website, use as a standalone website, or link to from your Instagram, Facebook or Twitter profiles. 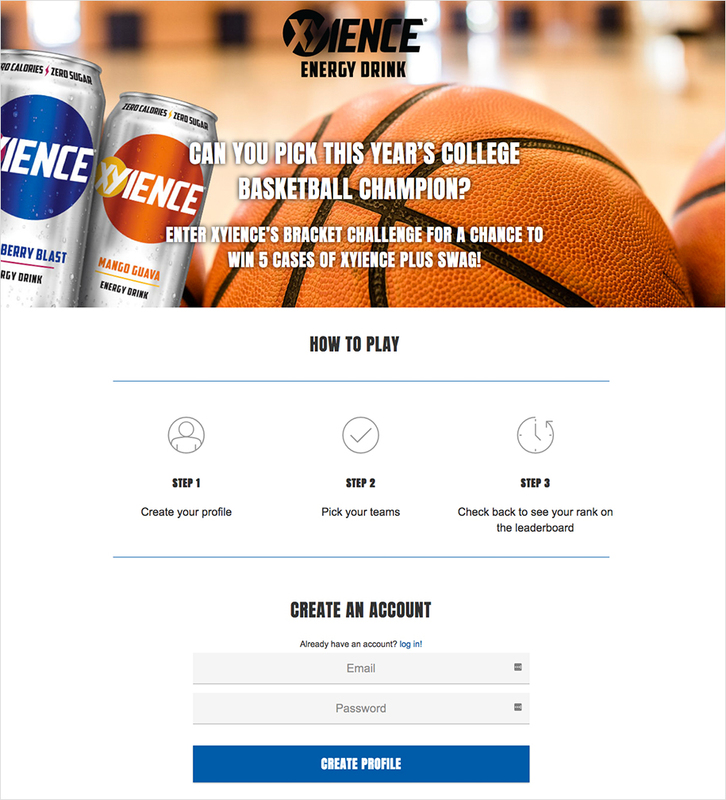 These brackets are, hands down, a great way to engage customers during NCAA tournament. People will check in periodically throughout the tournament, or even after every game, to see their bracket standings, keeping your campaign and brand top-of-mind. Want something a little simpler that you can build yourself? Try a Guess the Score campaign. 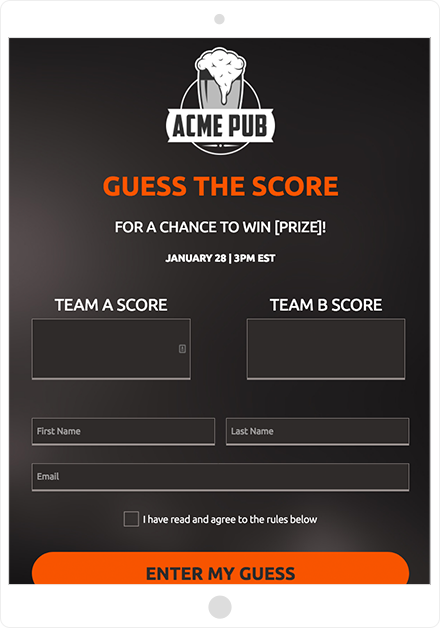 With a Guess the Score campaign, entrants will try to predict the score for a specific game. You could create giveaways for all the different games, or concentrate on specific games, such as games played by the team from your state or city, the games played by the Tournament’s “Cinderella” team, or perhaps just the “big games” for that week. A benefit of the ease-of-entry for Guess the Score campaigns — they help to build your email marketing lists. Just ask for entrants’ names, email addresses and their score prediction. Then, use this information to announce the winner of the contest, as well as to promote your business. Similar to a Guess the Score contest, a Guess the Winner contest will ask entrants to choose a winner for either a specific game or the tournament as a whole. A Guess the Winner contest is pretty simple to set up, just use our Giveaway template, then add in a field for people to choose the winner. A dropdown field with teams people can choose from will make choosing a winner easy. You could use our filter feature to choose a winner from those folks who guess the winners correctly. Want to use Instagram? Any campaign you create with ShortStack can be linked to from the link in your Instagram bio. However, if you want folks to enter using a specific hashtag on Instagram, then I have just the idea. Try a match-up, where folks need to choose a winner by posting an image along with specific hashtags. For example, say Duke and the University of North Carolina are facing off. Then you could ask folks who think Duke will win to post: #duke[YOURBRAND] #dukevsUNC and UNC fans to post: #UNC[YOURBRAND] #dukevsUNC. Give fans a chance to show off their school pride. I don’t know about you, but dressing up in my school colors while I cheer on my team is one of the best parts of watching a game. Challenge your fans to show off their school spirit by showing off their game day get-up. Photo contests are fun for entrants and help promote both customer engagement and brand awareness. There are a couple of ways you could execute this type of a campaign. One is with a Hashtag contest. Just let fans know the hashtag(s) they need to use, then encourage them to post their entries on Instagram and/or Twitter. Another way is with a Photo Contest where people need to submit their entries via a form. You could still require people to post their entries on Instagram with a specific hashtag, but in order to submit their entry, folks need to submit their image via a form. This allows you to collect names and email addresses for remarketing purposes. Want to keep people engaged throughout the tournament? Try a multi-day giveaway calendar. You could add team-specific basketball or NCAA tournament trivia into each day’s entry form. 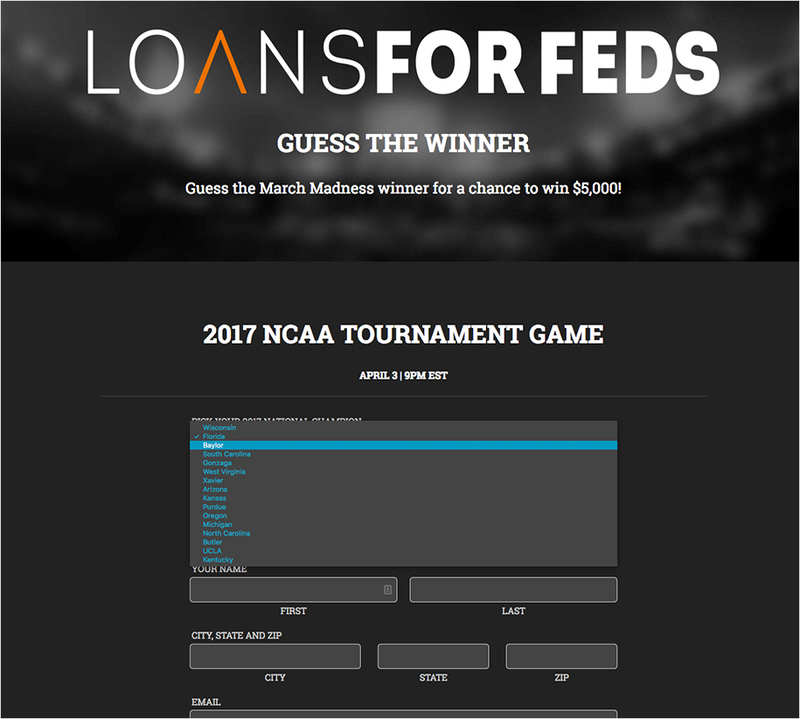 The trivia will keep each day’s entry fresh and allow folks to show off their college basketball knowledge. Your calendar could run the entire duration of the tournament, or during a specific time period, such as the days between the Final Four and the Big Dance. Give people the chance to watch the tournament in style. Big get-togethers featuring hours of college basketball is what March Madness is all about. Nothing says “March Madness” like game day snacks, some cold beers and friends. Be the hero for a few lucky fans and giveaway the ultimate game-day viewing package or gift cards to help folks fund their party. 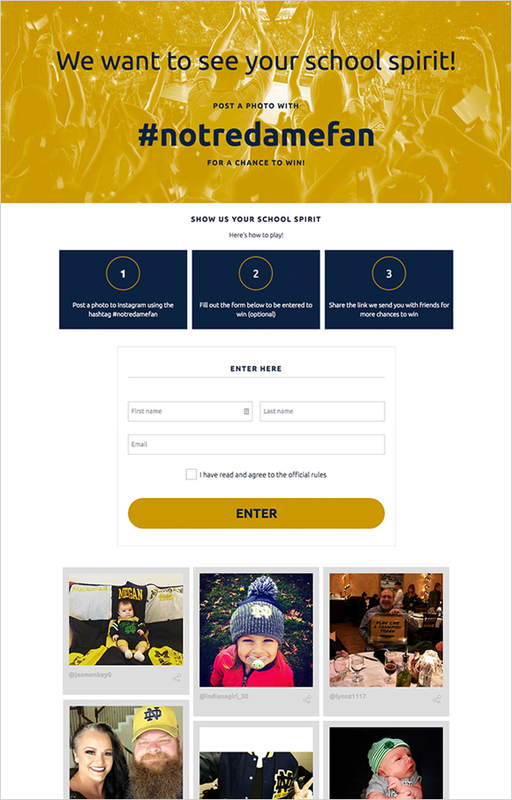 Send an autoresponder to entrants after form submission with a coupon to your store, recipes for delicious game-day grub or a printable tournament schedule. Will you be showing the tournament games at your restaurant or bar? Get folks through the door by giving away a VIP viewing experience or some gift cards folks can redeem during the games. After you collect the entries, be sure to use our Marketing Automation features to send emails to your contest entrants. Let them know about any game-day specials, game schedules, whatever you want! More ways to celebrate March Madness. Ask folks to choose their favorite team in order to enter your contest. This increases engagement and still allows you to collect leads. Plus, it’s a bit more fun than just an entry form. 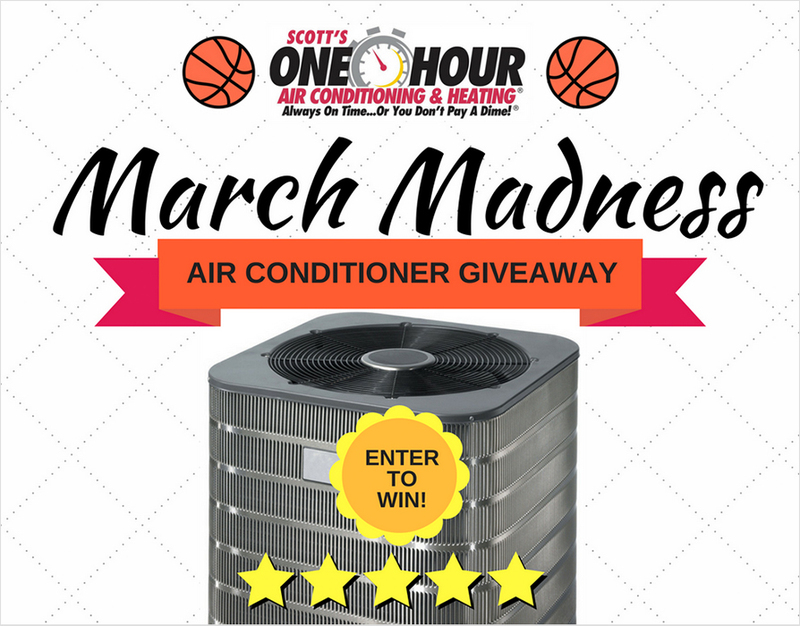 Keep it simple and use March Madness as an excuse to run a crazy-good giveaway. Giveaways are simple to enter and allow you to build an email marketing list to use for remarketing purposes. Plus, folks who might not be as wild about the tournament may find a non-basketball related contest more approachable. Don’t miss out on the opportunity to take part in an exciting time of the year. Just because you don’t have a multi-million dollar advertising budget doesn’t mean you can’t use events like the NCAA Tournament to reach your target audience. If you have any questions, or if you’d like to share how your March Madness campaign with us, just shoot us an email: theteam@shortstacklab.com. Go team!